“National Geographic” has an overview of the superstition’s historical and biblical roots, and the impact the day has on the economy. 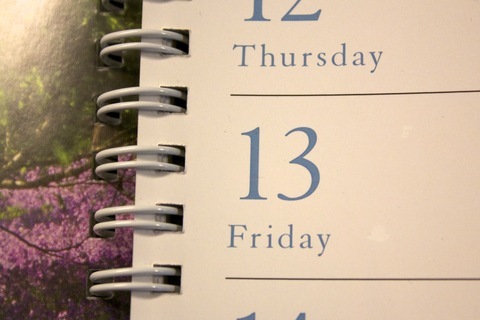 Irrational fear of the date leads to people refusing to do normal activities. “$800 or $900 million is lost in business on this day because people will not fly or do business they normally would do,” Donald Dossey, a folklore historian and founder of the Stress Management Center and Phobia Institute, told the magazine. “Once [superstitions] are in the culture, we tend to honor them,” Thomas Gilovich, a professor of psychology at Cornell University, said in the piece. “You feel like if you are going to ignore it, you are tempting fate,” he explained. The 13th guest of the Last Supper was Judas, the supposed betrayer of Jesus that lead to his crucifixion (which happened on a Friday, by the way, adding more fodder to the connection between the day and date). If you were a witch in ancient Rome, you gathered in groups of 12 — because the 13th was believed to be the devil. And if you build a modern-day high-rise building or airport, best to keep “13” off. 80 percent of high-rise buildings skip the 13th floor, labeling from 12 to 14 instead.